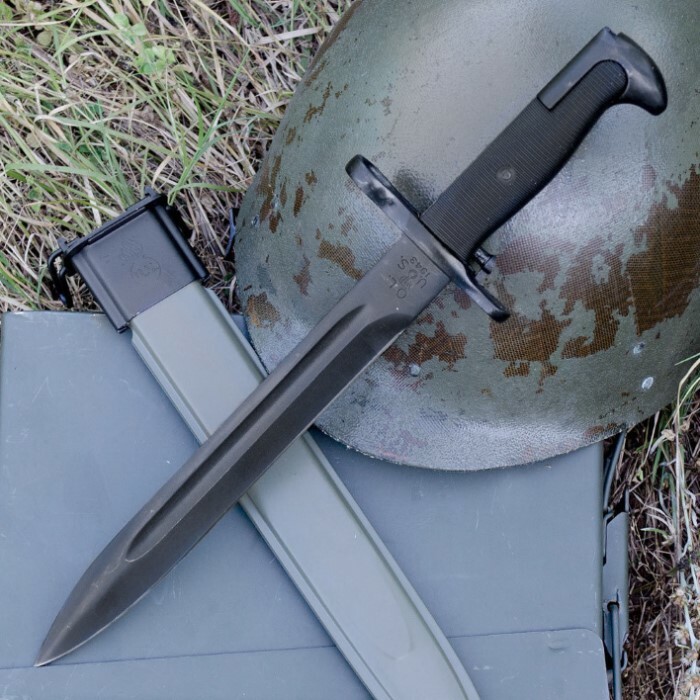 M1 Garand Bayonet Historical Replica - 15" | BUDK.com - Knives & Swords At The Lowest Prices! M1 Garand Bayonet Historical Replica - 15"
The legendary M1 Garand rifle once bore bayonets just like this historically faithful replica. It features a 9 3/4" black coated stainless steel blade and a textured handle for a slip-free grip. 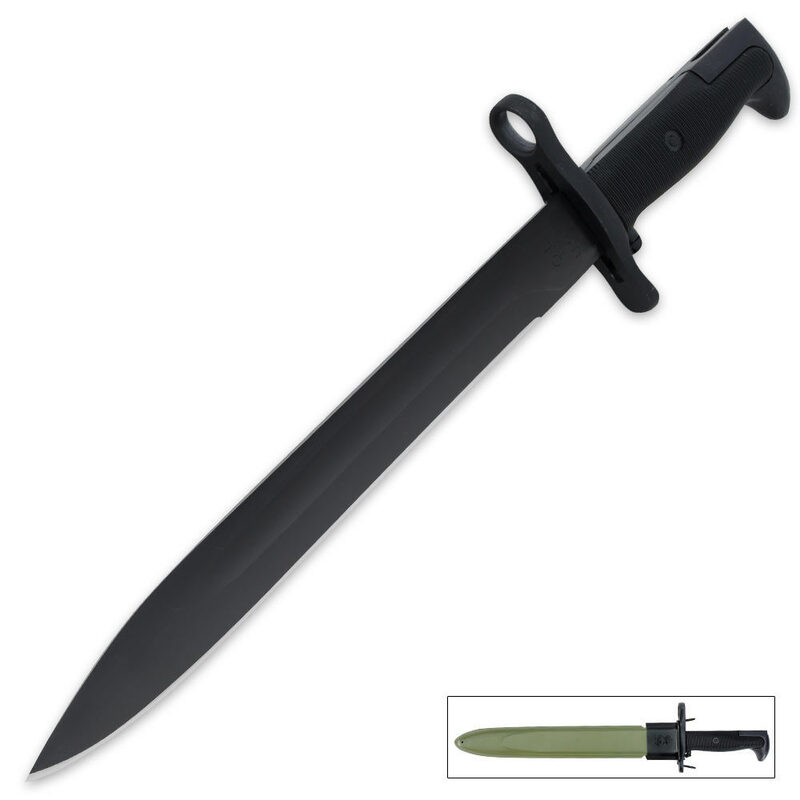 "US 1943" is delicately etched on the blade, and our historical reproduction includes a sturdy locking scabbard. Called "the greatest battle implement ever devised" by General Patton, the M1 Garand officially replaced the M1903 Springfield as the standard service rifle of the US Armed Forces in 1936, becoming one of the most recognized pieces of military weaponry in history. The legendary M1 Garand was used exclusively by US forces in World War II and the Korean War, and to a lesser extent in the Vietnam War. 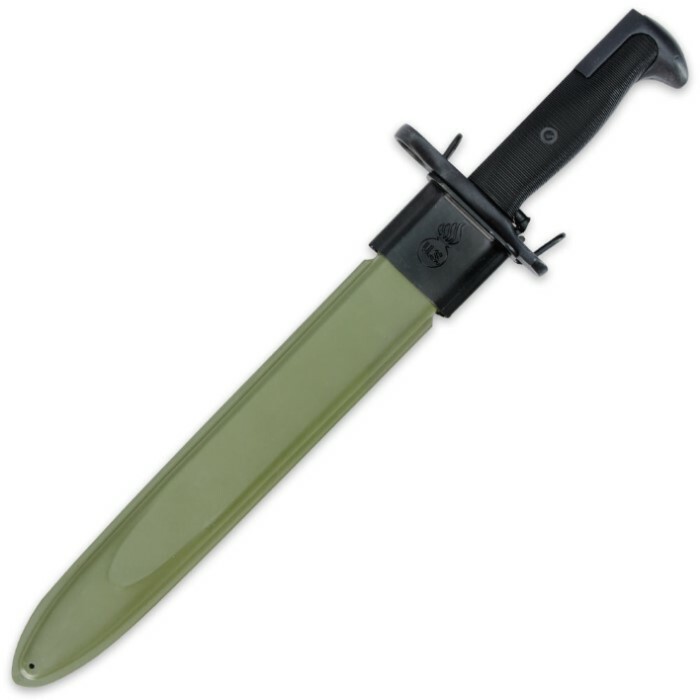 This M1 bayonet looks great and authentic. The weight of the bayonet is substantial. Much heftier than I expected With a little light sanding and steel wool it takes on the petina of a WW II weapon. My only complaint is it does not lock on my M1 Garand. The fitting on the end of the handle is too shallow to accept the lug on the rifle and lock securely. Kind of bummed out, was really looking forward to adding it to the Garand. It looks ok on the rifle, but without it being locked I won't display it that way. Nice replica for my collection of WW2 memorabilia for a reasonable price. I don't own any rifles and haven't tested how well this functions as a bayonet, but I will review how well it functions as a knife. The center of balance is about 0.75in past the guard, rendering it a little blade-heavy. It definitely feels somewhat weighty in the hands. I believe the grind is intended to be Scandinavian, but when I received it the secondary bevel angle (where the actual edge is) was not quite the same on both sides of the knife. This (and probably other factory reasons) rendered it very dull and took quite a lot of work by hand to get it capable of cutting. Having to re-grind one of the secondary bevels involved a lot of trial and error; I don't recommend attempting this if you are just beginning to learn sharpening. The handle is comfortable enough and the large groove at the end prevents one's hands from slipping off. The sheath works well. It has a slot to allow for carry on a belt so that the knife will be parallel to the belt (so when standing up, if one sticks one's hand straight out, it will be parallel to the knife). This allows for a nice, fluid draw as opposed to knives that attach perpendicular to the belt, which are awkward to draw. The knife locks into the sheath on both sides of the guard and is secured by a small lever on the knife. I doubt that it will ever fall out unintentionally. Overall there is a lot of material for the money. It would be very good as a display piece if one does not want to put in some work on the blade, but if one skillfully sharpens it it will become a pretty decent knife. i was a little hesitant to order after reading some of the comments, but now I'm glad I did. This bayonet fits my CMP Springfield M1 Garand perfectly. It's tight withought being binding, and the latch works flawlessly for both the locking lug and the scabbard. And of course it looks great, too. Face it... an M1 is just not an M1 without a sling and bayonet. I might even get the long one now that I know they fit. Looks good. Very close to the original. The lug slot was too small and would not fit on the rifle. 5 minutes of filing on rifle lug would have fixed the problem, but I wasn't willing to deface the rifle. Spent hour and a half with a tiny file working on the lug slot to make it fit. After the modification it works just fine. When the bayonet arrived the first thing I checked was the blade. And I found it to be very dull. I work it with a stone and also a steel but could not get a fine edge on it. Some Chinease steel is bad for knives I have two other china blades that are the same you can't get them to hold an edge. Nice to look at but useless for anything. I like all my blades to be razor sharp the way they were ment to be.if it were made in Pakistan the blade would take an edge they use goog steel. I bought several of these after reading the comments. I was not disappointed. Compared side by side it is very close. Very small China on the blade can easily be covered. Well worth the money. If the release button was sturdier I would give this a five star rating. Visually it rates a five. It's Exactly like the one I had in Europe 49-52 on ny backpack while on patroll of the Russian border of the American sector! It attached to my refurbished M-! Gurand without any fitting! !I like it!! I have an original bayonet and it is difficult to tell the difference. Great copy.